1. experiment with different toys and ways to play with your dog. Tape his favourite game. - crossing paws: tell the puppy to down (or shape it if he doesn't know it yet), then hold the plate (or, you can use another, smaller and more convenient object, like a plastic lid or a piece of paper) close to left paw and only reward touching it with left paw. Then hold it closer and closer to right paw, still only reward left paw touches, then hold it on right paw and eventually on the other side, jackpoting the touches of left paw on a right paw now in order to eventually get rid of a target. - sit up: tell the puppy to sit (or shape it if he doesn't know it yet), then put the plate (or just use the hand if he will recognize that as a target) low enough first that he can reach it with a paw, but then every next time, hold it a little higher - not that high that he would stand up, but high enough that the other leg leaves the ground a little bit too. Jackpot. 4. observe your puppy and try to find situations when he would back up - it usually happens when they're moving out of your way - or sometimes when they really want something, but know they can't get it. You can try to sit down on the floor with treats in your hand and click first step back with hind foot. Don't wait for more than one as they usually sit down then. Click&reward the first one and reward by throwing a treat towards the dog. Rewarding at distance will help you add more&more steps and more&more distance from you. At one point, switch to rewarding with a toy, it's easier to throw. 5. 2on2off - find an object big enough for a dog to go on with all 4 feet easily - maybe just put your first 4in object upside down? - Click for 2-3 legs on and then don't click the fourth one, you don't want any duration standing there! Only click again when the dog is leaving the object, try to catch him with 2 front feet on the ground and deliver the treat while he is still in this position. Click&reward several times for a position, then say "go"/"o.k. "/"free"/whatever your release word will be and throw a treat away so that he needs to leave the position to get it. 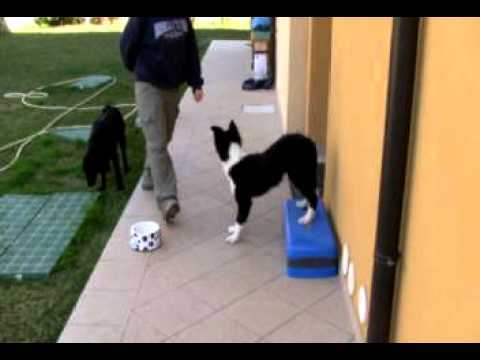 Do this enough times that the dog starts to expect the thrown treat after "go", so that then you don't need to throw it in advance, but only after he leaves the position on "go". Do not help with body language that you want him to leave after "go" - if he doesn't know it yet, go back to throwing a treat and progress more slowly. 1. She like tugging, but only if we do it this way. I am building up tension for the toy, and when we tug.. we both growl ;). Other then this, there is one (latex squeeky) toy that she loves the most, but it is not really playing together. We use it as special toy for forward movement in agility (old one is used with backing up). 2. I am proud of this one, as we have tried to do this many times and never finished it as a trick because “it didn’t work”. Well.. thanks to lesson 1 I know it didn’t work because I was clicking to slow :)). So now it was almost a piece of cake. Clockwise that is.. because counterclockwise she really needs me to help her get the direction. Is it ok to start heelingposition now, or do you think we need to train counterclockwise more first? 3. Ooohhh. Pff… Maybe I should try clickertrain chickens first. Csilla is so much faster then me, that I am training her to be very sloppy in touching. She gets frustrated, I get frustrated…. aaaarrrggghh! She can do the touch, no problem. But combine touch with a sit/down is very confusing. So now I try to calm us both down first by stroking her, and then try to get some touches. Seems to work, so I’ll continue this for now. 4. I started training this when she was still a puppy, and then she choose to go down, jump backwards, and go down again. That was funny to, so I started to click for that. You still see her hopping backwards now, from time to time ;). 5. Was fun!!! I absolutely love the tries we did with the recall :). Smart little girl. Oh, she is too funny with 2on2off (and sometimes too fast 🙂 ) Playing and backing up looks great too. I know the problem with paw targeting from La, she can’t understand why should she be moving just one leg when she can move two or even all four 🙂 and will just throw herself on a target. So I actually taught her paw crossing by shaping, clicking for any paw movements first and then selecting for moves in the right direction. It took me much longer as with a target with other dogs, but with her, it was just too chaotic with the target. You could also shape sit up -- different dogs, different approaches. For the circling: can she do it also without your hand there as a cue? If yes, then you could start with heeling, if not, I would first get rid of that hand. 2on2off I was teasing her, just for play, but it was so funny I couldn’t help to put it in the video, hihi. You can use the hand cue, but minimalize it -- ie. show direction with a gesture, but keep the hand at your side, don’t have it above her head all the time as that promotes looking at your hand and that can cause problems in heeling. More videos coming soon on next lessons. Be careful with timing, you often say “o.k.” and she is still standing when you click and then you throw, so basically, you’re rewarding her for staying after a “o.k.” 🙂 For now, say “go” and throw a treat at the same time and click when she is leaving as you ARE clicking for leaving, not staying ! -- and then split the two as we were discussing with Gitte and Dinah. When playing, try to be more active, go down on the floor with her, push her around with another hand, growl etc. You need to play with her as much as another puppy would play with her as possible to make it even more fun. But well, that sure is a good start, she sure is playing now, just make it even more exciting!